Yummy, Low Calorie Diet Food -- Plus Where to Buy! : Coconut Water – A Perfect Low Calorie Beverage for Sweltering Summer Days! Coconut Water – A Perfect Low Calorie Beverage for Sweltering Summer Days! For those who haven’t been paying close attention, I have been very much into coconut lately (I even have a post about coconut milk ice cream coming up soon)! Today's post is about coconut water. I have to be totally honest, though, coconut water doesn’t really taste all that great on it's own. But it has a wealth of nutritional benefits and it can be mixed in with other foods – so I’ve added it to my diet as much as possible in recent months. Now that the summer months are wreaking havoc on my outdoor workout, coconut water has been tops on my list due to its ability to hydrate. (Interestingly, the first time I ever heard of coconut water, a friend of mine in college was drinking it to cure a hangover; I later found out that it eases nausea that causes vomiting). There are a sundry of benefits that can be reaped from coconut water, including relief from urinary problems. Coconut water may help to break up kidney stones. And it is said that drinking coconut water combined with one teaspoon of olive oil for three days will eradicate intestinal parasites, which helps to detoxify the body. Coconut water’s anti-bacterial properties also make it an ideal health-booster that may help to ward off flu and other maladies. It is also purported that coconut water can help counterbalance the symptoms of thyroid disease, but I could find no real documentation to that effect – although it could be worth talking to your doctor about if you have thyroid problems. Coconut water has been a homespun remedy in tropical regions of the world for ages – used for treating everything from irritable bowel syndrome to chronic fatigue. 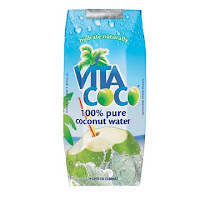 One of my favorite coconut water beverages is Vita Coco , which has fifteen times the amount of electrolytes that are found in sports drinks. According to Vita Coco’s website, they use only green coconuts when packaging their coconut water. Why’s that important? Green coconuts have more health and nutrition benefits that brown coconuts. And their product is filtered and pasteurized. (Never, ever go for unpasteurized coconut milk). I found Vita Coco at my local Whole Foods, but I have also seen it on display at GNC and Safeway! The easiest way to work coconut water into your diet is to add it to a healthful smoothie. A basic coconut water smoothie can easily be made using: a cup of coconut water, the meat from a young coconut, two cups of fresh leafy greens or baby spinach, and your choice of fruit (large peach, large mango and a kiwi, or a medium banana and handful of strawberries). Add all of the above to your blender with a cup of crushed ice and blend until smooth. This coconut water smoothie is delicious and will provide you with a yummy pick-me-up snack any time of the day! Coconut water on its own has 46 calories per one cup serving and is cholesterol-free, high in calcium, dietary fiber, potassium, Vitamin C, thiamin, phosphorous and magnesium. If you love coconut as much as I do you should check out some of my other favorite coconut-filled foods: coconut ginger soup, coconut ice cream bars, and coconut yogurt. Vita coco tastes so good. Do you wonder why Madonna and many celebrities not only drink, but also invest in Vita Coco? They are really into healthy stuff! I LOVE this stuff! Its so good. After a workout its amazing. Taste great.